You will be hard pressed to find a Clone Trooper costume that has more authenticity than this deluxe Star Wars costume, which looks like it comes straight from the Episode III film. This Clone Trooper jumpsuit is made of 100% polyester and has EVA rubber armor pieces sewn into the suit. These rubber parts include: shoulder flaps, chest armor, shin guards, codpiece, arms and upper thigh sections. The armor is painted with shades of blue, grey and white. The costume also features a white vinyl belt (which fits sizes up to 48”), and attached foam shoes covers. Lastly, the costume is finished off with a highly detailed 2-piece PVC helmet - one for the front and another for the back. The two pieces fasten together with sturdy Velcro while visibility is made easy by a clear visor. 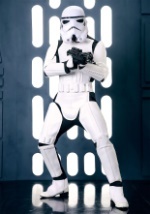 There will be no question who has the coolest costume at your next party with this deluxe Clone Trooper uniform.